Saturday January 2nd 1892 Weather a little better than yesterday. I was busy about the work all forenoon and in the afternoon and evening worked on my lace. Jen Woolf was here in the afternoon. I got a beautiful stand over as a present from Alden Brown. I wrote to Charlie in the evening. Sunday January 3rd 1892 I was busy about the work all forenoon. Johnny came back this morning. We went over to Marys in the afternoon to take over with them what we saw in the Delavan paper about Dwight. Father & Mother came home this evening. I read all the evening. 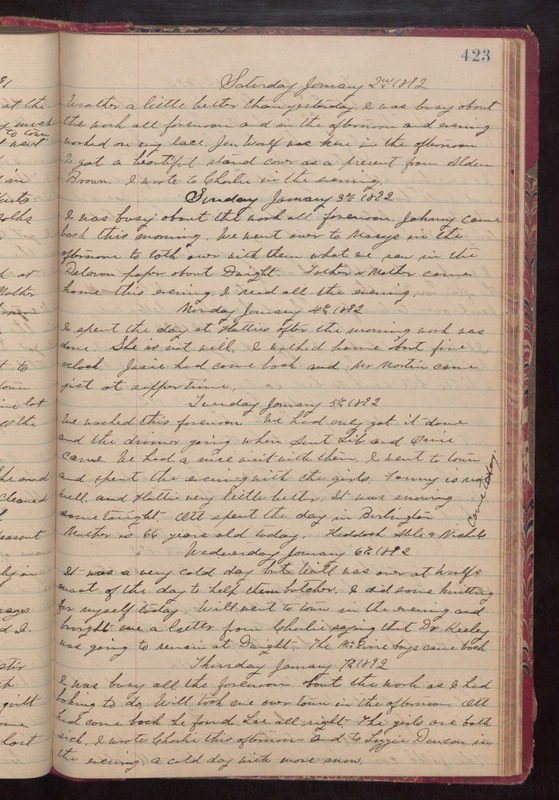 Monday January 4th 1892 I spent the day at Hatties after the morning work was done. She is not well. I walked home about five oclock. Josie had come back and Mr Martin came just at supper time. Tuesday January 5th 1892 We washed this forenoon. We had only got it done and the dinner going when Aunt Lib and [Olive?] came. We had a nice visit with them. I went to town and spent the evening with the girls. Fanny is not well and Hattie very little better. It was snowing some tonight. Ott spent the day in Burlington. Mother is 66 years old today. Heddrick Able & Nicholas came today. Wednesday January 6th 1892 It was a very cold day but Will was over at Woolfs most of the day to help them butcher. I did some knitting for myself today. Will went to town in the evening and brought me a letter from Charlie saying that Dr Keeley was going to remain at Dwight. The McGuire boys came back. Thursday January 7th 1892 I was busy all the forenoon about the work as I had baking to do. Will took me over town in the afternoon. Ott had come back. He found Lee all right. The girls are both sick. I wrote Charlie this afternoon and to Lizzie Duncan in the evening. A cold day with more snow.